Since its foundation in the first half of the 13th century, Toruń had been enclosed within a double line of defensive walls (the so-called lower wall outside and the higher wall inside the city) with a wet moat between them. 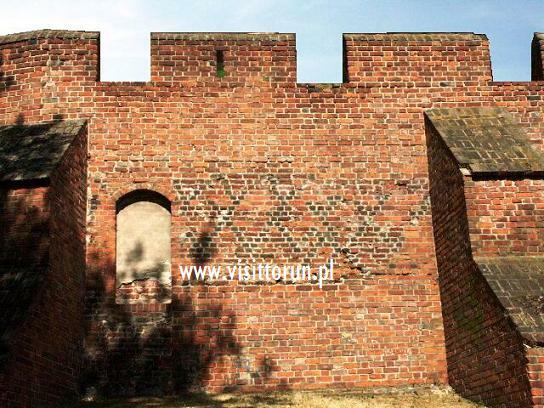 Only the part facing the Vistula consisted of a single line of walls. In the following centuries, the walls were continually improved – they were heightened, strengthened and extended. The first modifications were made as early as the late 13th century. All the three Toruń urban units, i.e. the Old City, the New City (which, despite their unification in 1454, were separate units with the wall running along Podmurna Street) and the Teutonic Castle had their own defensive system. The 4-kilometre (2.5 mile) wall included 54 fortified towers, 11 gates and 2 typical barbicans. Nine towers and three gates have survived till today. Throughout the construction works, the walls, fortified towers and gates were adorned with ceramic friezes, motifs painted in the plastered blind windows, dark bricks arranged in rhombic patterns and other such things. Fragment of preserved southern part defensive walls of Toruń Old City. Map of the Toruń medieval defence towers (the icons), defence walls of Toruń Old City (blue lines), defence walls of Toruń New City (red lines). The tower built in the 2nd half of the 13th century together with the northern part of the defence walls, on a square plan and remodelled into the present rounded form structure at the turn of the 15th century. In the same form the towers (non-extant): the Cat's Stomach and the Cat's Tail (see the remnants here) were rebuilt. These three towers, as well as non-extant two barbicans, were equipped with artillery positions, the fire fileds of which covered the whole field of the foreground line of defence of the Old City of Toruń between the Vistula and the New City of Toruń. It is one of the oldest wall towers of the Old City of Toruń (from the late 13th century). Like any other, it was open from the side of the city, and only in the 17th - 18th centuries the fourth wall was added. Approximately in mid-18th century the 1-storey outbuilding was attached to the tower from the street side, which in the mid-19th century was rebuilt and cargo crane was added; that was the period when the tower was used for storage. In 1911, the outbuilding was demolished and replaced with 3-storey tenement house, which absorbed the tower. Only in the mid-1980s the tenement was pulled down and it was decided to expose the Gothic tower. At No. 30 Podmurna Street there is tower built in the second half of the 13th century, which is the remnant of medieval fortifications of the Toruń Old City from the side of the Toruń New City. In the nineteenth century it served as granary. Interior sightseeing: not available for tourists. At No. 26 Podmurna Street there is tower built in the second half of the 13th century, which is the remnant of medieval fortifications of the Toruń Old City from the side of the Toruń New City. In the nineteenth century it served as granary. The tower was built probably at the same time as the city walls. i.e. in the second half of the thirteenth century as a rectangular building, and then rebuilt in an eight-sided in the first half of the fifteenth century. The tower stands within the city walls separating the Old and New Cities of Toruń. The tower derives its name from the name of the liturgical vessels, the image of which crownes the top. It is the only tower in Toruń built on octagonal plan, in contrast to the other - quadrilateral. Today the tower adheres to the Gothic building of the St. George Guild House and they both constitute a unitary complex. The tower dates from the late thirteenth century and is considered to be the oldest extant urban bastion. Built on the quadrangle plan. The complex of St. George Guild House and Tower was rebuilt in 1883. 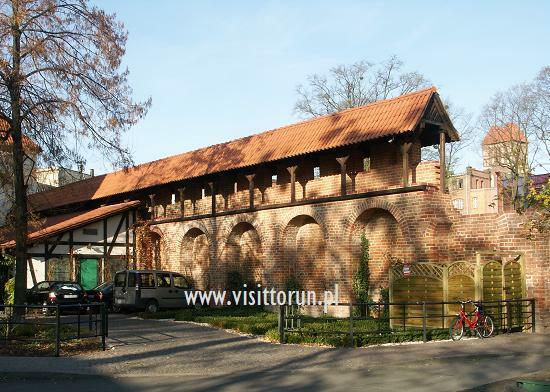 They are located in the intramural area of the former upper approach of the Teutonic castle. The tower situated within the southern part of Toruń Old City walls. It comes from the late 13th century. The name comes from the functions of the crane, which was served following by expansion in 1823 when the tower was connected with the Swedish Granary (>>) on its back. From this period all the mechanisms come from. The tower situated within the southern part of Toruń Old City walls, between the Convent Gate and the Sailors Gate. The tower dates back to the turn of the 14th century. The old façade from the side of the Vistula is fragmented by four blind windows with coloured Gothic ornamentation. In the 19th century the tower was converted into a dwelling. Iron hooks at the top come from the same period, when the dovecotes were held here for the carrier-pigeons (hence the name of the bastion). The Leaning Tower was a typical fortified tower, built as a part of the city walls at the turn of the 14th century, clearly as a straight tower. Interior sightseeing: no sightseeing. The city authorities have decided to put there a pub and the bureau of the Municipal Instiutution of Culture Toruń 2016 instead of making it available for tourists.